The material presented here is my original creation (unless otherwise attributed), intended for use with the GURPS system from Steve Jackson Games. This material is not official and is not endorsed by Steve Jackson Games. The last FUMcon was held in November 2009. You can access support files for the games here. You can find some sample characters and arena graphics for online GURPS combat sessions here. This is a custom ruleset for Fantasy Grounds II, providing the tools you need to play GURPS online. It contains PC and NPC sheets for GURPS 4e, together with a combat tracker. In accordance with the Steve Jackson Games Online Policy, there is no automation of the rules or inclusion of copyright rules content. The ruleset is packaged with a Windows installer, which creates the file GURPS_4e.pak in your Fantasy Grounds program directory. If players have the ruleset PAK file installed there should be no need to download the whole ruleset from the GM's machine when connecting to a game for the first time. New tabs added to the Items sheet in v0.96 to hold the stats for Vehicles (Basic Set) and Spaceships (GURPS Spaceships). Grid scales added for pointers in v0.95, courtesy of code from Brian Ronnle. Set the grid scale in your preferences and it will be shown when drawing pointers on an image. This allows you to export characters created with the official character generator for GURPS 4e. 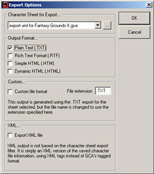 Characters are saved as an xml file. Instructions are included on how to edit your FG2 files to import the characters. Alternatively, you can load these files into Fantasy Grounds using the utility provided below. GURPS Character Assistant can be purchased from e23. 18 May 2010: Fixed bug where Legality Class was output instead of Recoil for ranged weapons. 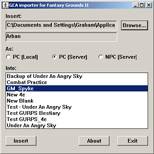 This utility can import the files generated by the export filter from GURPS Character Assistant into Fantasy Grounds II. It can load characters as a local PC (to allow you to join a game as a player), as a server PC (i.e. loaded into a specific campaign), or converted into an NPC for a campaign. Warning: this utility is still in alpha test. It seems to be working fine, but please back up your Fantasy Grounds campaigns folder before use! 15 April 2010: Updated to remove 15 NPC limit (debug code left in accidentally). Requires v0.95 or later of the GURPS 4e ruleset for Fantasy Grounds. This is a conversion of the 4e Combat Cards data included in the free pdf by Andy Normansell and Robert L. Beaver, from Steve Jackson Games. Save the file in the Modules folder in your Fantasy Grounds application folder. Use the Modules button once you have opened your campaign to add the module by dragging the book icon open on the Cards panel. Drag the green tick to the panel to open the module for your players. Many thanks to Brian Ronnle for the conversion. GURPS Combat Cards is copyright � 2005 by Steve Jackson Games Incorporated. See the Copyright notice in the library module. These skins (and others) can also be downloaded from Oberoten's repository at http://oberoten.mine.nu/ext/. Create an extensions folder in your Fantasy Grounds application folder and put the file there. You'll need to update your copy of FG to v2.2.0 or later. A simple, blue skin for games from late 19th century through to present day. Removed colon from skin name to avoid crashing some player clients. Updated to be more generic - works with both GURPS and d20 variants. This is Cyjack's Ultra-Modern skin. I've updated it to work as an extension and added a few files needed for it to work with the GURPS ruleset as well as d20 variants. Note that Cyjack has done a detailed job replacing the default graphics, and so the file size is large. This will add a corresponding overhead to the time it takes players to connect to your campaign for the first time... but it's worth it! This is a link to Foen's Traveller theme skin, which works very well with the GURPS ruleset. Download the file with the .ext file extension, and put it in the extensions folder of your Fantasy Grounds application folder. 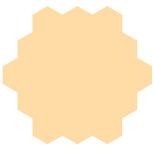 This is a set of three transparent orange hex overlays for use in Fantasy Grounds or other VTs. They provide area markers for 2, 3 or 4 radius effects. Scale them in the VT to the right size for your map. The overlays are prepared for vertical hexes but you can easily rotate them if your map uses a horizontal hex grid. I'll probably add to these as time goes by. Let me know what would be useful.